Today I said good bye to Tent. The weather is too cold for camping, it is dropping to around 6 degrees at night. I have been carrying Tent as an emergency accommodation option. Although I used her in Guines where I camped for free, I quite possibly could have been accommodated in a chalet (read cabin in English) if I had asked. It is the off-season here. August holidays are well and truly over and Autumn is commencing. I have not had any problems securing accommodation so far even when I don't book and just turn up to a town looking for somewhere to stay. The guide book warns me of the places that have limited accommodation and where I need to phone ahead. So there really is no need to carry Tent with me anymore. This morning, I carried Tent to La Poste to post her home to Australia. However, Tent was too big for their largest box. Even after unwrapping her to try and cram her into the box, she wouldn't fit. Madame said something uninterpretable but I understood it was not possible. "Ou?" I asked her. Where can I go to ship it? She shook her head then said further uninterpretable sentences in French. There was nowhere I could go to send Tent home. Not ready to give up. I walked to the Tourist Information Office knowing someone there would speak English and might be able to tell me where to go. No. Problem. They spoke English okay but if La Poste couldn't send it for me there was nowhere that could. Madame spent the next 15 minutes trying to find an option for me. Eventually, she found a FedEx or equivalent and phoned them for me. It sounded very promising until I heard, "Non." Madame hung up and told me it would be very expensive with taxes and needing a company to sign things. There was only one other option. To leave Tent behind. "Who can I give Tent to, to give to someone who might need Tent?" I asked. 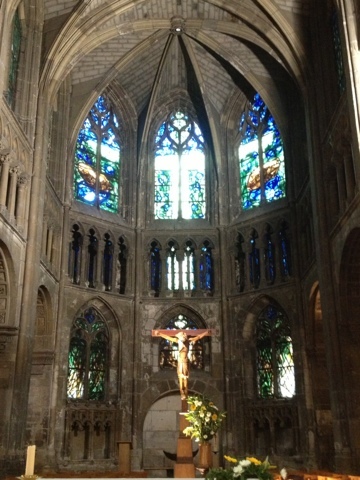 "Maybe the Cathedrale?" Madame suggested the Parish Office across the road. I thanked her profusely for her help and walked over to the glass Parish Office, spoke to the Secretariat in part English and part French and then handed Tent over to her to hopefully find its way to another pilgrim who might need her for their journey. As I walked away, tears welled in my eyes. Letting go of Tent means I am instantly lighter by almost 2 kilos. Letting go of Tent means I am vulnerable; my security blanket is gone. I have no choice but to trust that all my needs will be met on this journey and that I will always find a roof over my head. This is the highest level of trust that I need to experience in my life right now. There's a quiver of fearof fear in my belly but I trust more than I fear. Today was meant to be a rest day but I have still managed to walk 18 kilometres around Reims albeit without the weight of The Devil on my back so my ankles and heels are not aching. 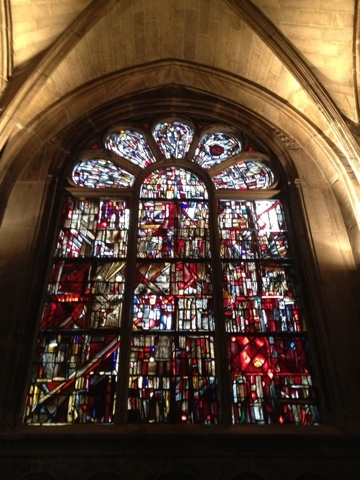 I have spent more time in Notre Dame Cathedral admiring the beautiful blue of the Marc Chagall stained glass windows once again. 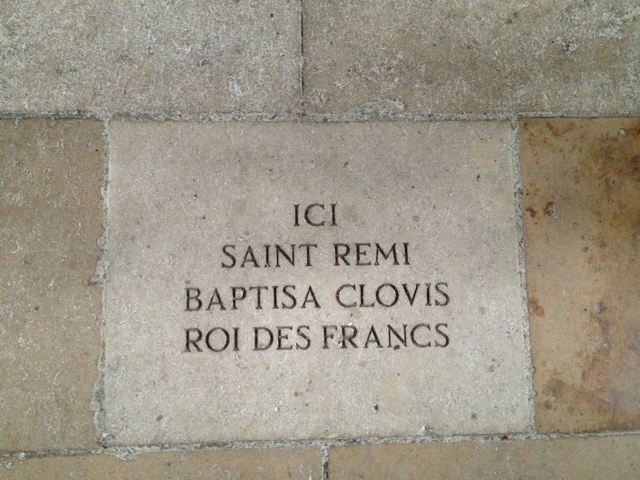 I have visited Saint Remi Basilica, one of the most important Romanesque creations in the North of France. 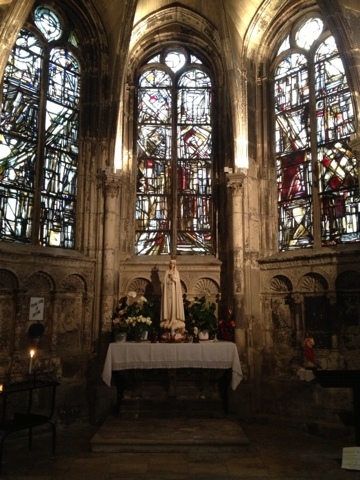 It was built in the 11th century to house the holy ampulla and relics of Saint Remi, the bishop who baptised Clovis in 498 and houses his tomb. I visited the small church of St Jacqes where I admired a completely different style of stained glass by Maria Helena Vieira de Silva and Joseph Sima famous artists who adopted French citizenship. Now I am sitting here drinking a glass of French Rose, my favourite style of wine here. Soon, I will eat dinner and go to my small bedroom at the simple but friendly Centre International de Sejour and slumber early. 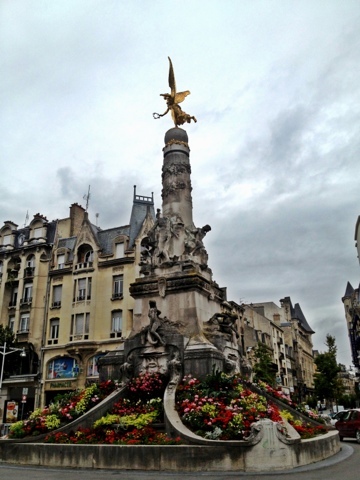 Tomorrow I will walk to Conde-sur-Marne. 37 kilometres with some steep climbs and muddy conditions. It will be muddy. It has been raining constantly for the last few hours. I missed walking today. I missed The Devil hugging my back. 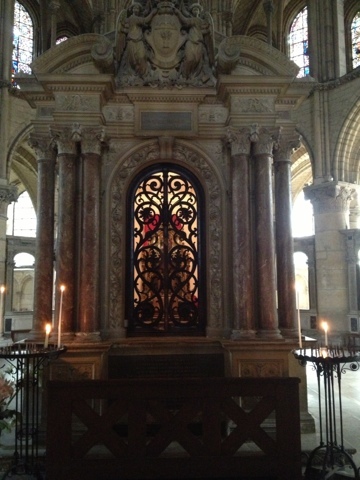 I like Reims but I miss the open space and solitude that I get to experience during the day. There was an urge to rest but there is an urge to keep going forward as well. And as there is an urge to keep going forward, there is fear that by going forward this journey will end too soon. Before I am ready. Before I have my answers. For now there is only one thing to do. Sleep and tomorrow I walk again. A little lighter, a little more vulnerable and leaning a little more into faith. 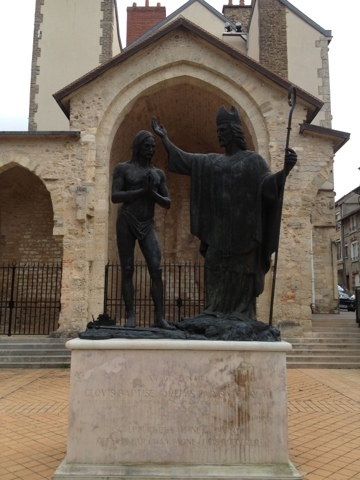 "France", "Reims", "Via Francigena", "hiking", "pilgrimage"